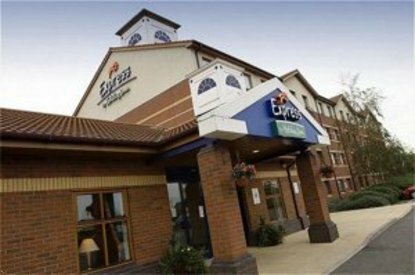 The Express by Holiday Inn hotel in Derby Pride Park is a purpose built hotel, with 103 bedrooms, ideal for both midweek business & weekend leisure travellers. We're also now fully air conditioned with a great new look in our refurbished reception, lounge & meeting roomOur great value rates include accommodation in a modern guestroom & complimentary continental breakfast . Each guestroom at our hotel in Derby is designed to offer comfort, convenience & the facilities you need - air conditioning, en suite power shower, colour TV, tea/coffee making facilities & comfortable beds with duvets.Our Derby hotel is ideally situated within the Pride Park retail & office complex, which is approximately 7 miles from J25 of the M1 Motorway. We are just a 5 minute walk from Derby train station & DCFC. A 10 minute walk from the bus station & Derby City Centre. Close to the hotel is a number of restaurants such as an Harvester, Old Orleans, Frankie and Bennys & Brewsters. The hotel has a well stocked bar that offers the oppportunity of a quiet drink in comfortable, pleasant surroundings. Vending machines offer a wide selection of snacks & soft drinks.Additional facilities at our hotel include meeting space & free parking.